Ladies and gentlemen, we present the first known footage of the French author Marcel Proust. Announced by Professor Jean-Pierre Sirois-Trahan in the latest edition of the French journal, Revue d'études proustiennes, the footage was recorded on November 14, 1904 (nine years before Proust published the first volume in his classic work, À la recherche du temps perdu/Remembrance of Things Past). 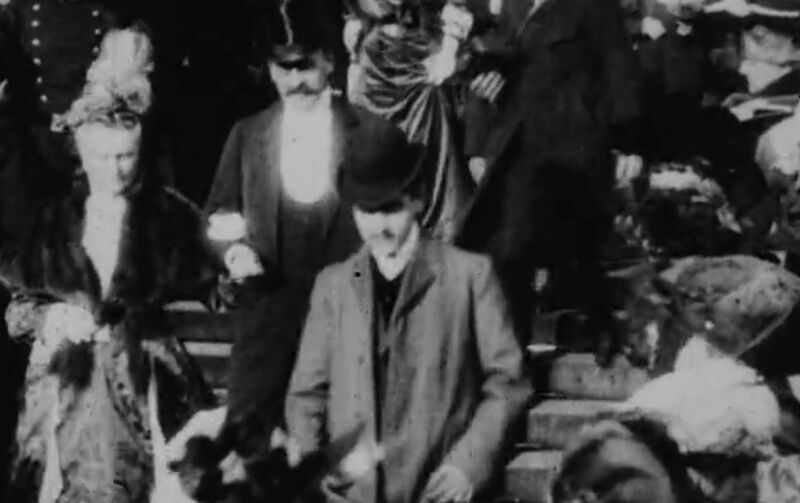 And it shows Proust descending a stairway at the wedding of his close friend, Armand de Guiche. Look for him at the 37 second mark. He's dressed less formally (in grey, not black) than the aristocrats joining him at the celebration. I've added a close up picture below. You say, “the video was recorded on November 14, 1904…” But of course it wasn’t, being in reality a filmed sequence. What was the piano composition that played in the film? much ado about absolutely nothing, bah! everything is news nowadays. can you tell us something really important about monsieur Proust that we really (really!!!!!) didn’t know? image? who cares? I’ll tell you something: Proust always carried a large magnet, on account of his belief that certain birds, due to the laws of chance, must have ingested some quantity of magnetite, and by bringing the magnet close to each bird he encountered, would find one sufficiently magnetic to be attracted and caught by the magnet. Nevertheless, he was shy about this contention, believing (and rightly so, as it turned out) that his neighbours might regard his interest in birds as unsettling, if not dangerous. Those corsets!! How did they breath? !